Gorgeous set from Hong Kong. 1941 King George VI SG163 to SG168 Centenary SET HONG KONG NICE MINT SEE SCANS. YOU CAN SAVE A LOT OF MONEY IN THIS WAY! Hong Kong Mint KG VI Stamps Cat £70 12 VALUES SEE SCANS FOR DETAILS. 1941 King George VI SG167 25c. Chocolate & Blue Mint Hinged HONG KONG. 1901 30c Brown SG61. Year of issue: 1901. Grade: Superb. Superb Used. Condition: Used. Newly Listed/New Arrivals. Commonwealth & Empire. Collections & Mixtures. 1885 20c on 30c Orange-Red SG40. Superb Fresh Lightly Mtd Mint. Occasionally we all make mistakes, and if we do we fix it. Ex - Sir Ron Brierley (Lionheart). HONG KONG 1938 GEORGE 6TH VALUES FROM ONE TO EIGHTY CENTS SEE SCANS. HONG KONG 1962 QUEEN ELIZABETH 197a ( 223) & SG199a MNH NICE PAIR SEE SCANS. 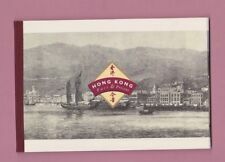 Hong Kong QEII 1954 50c reddish purple SG185 MNH NICE STAMP SEE SCANS. 1938 King George VI SG153 50c. Purple Mint Hinged HONG KONG. Hong Kong. 1941. SG163-168. Set x 6 values. Superb unmounted mint. Superb unmounted mint. Hong Kong. Farewell To Hong Kong. 2 Superb Benham Commemorative Covers Issued In 1997. Super covers in superb condition. Clive Turner. 1938 King George VI SG151 & SG152 30c. Mint Hinged HONG KONG. Hong Kong 1947 KGVI $5 yellowish green & violet (CH) superb MNH. SG 160ab. 1917 King George V SG4 6c. Orange Optd CHINA LMM HONG KONG. SEE SCAN FOR ITEM. INTERNATIONAL £6.00 EXTRA. excludes sending to P.O. Boxes: £10.00. 1905 1s Green & Orange SG73. Year of issue: 1905. Grade: Superb. Superb Used. Condition: Used. Newly Listed/New Arrivals. Commonwealth & Empire. Collections & Mixtures. Hong Kong 1921 KGV 8c grey superb MNH. SG 122. Sc 135. Hong Kong 1921 KGV 8c grey superb mint never hinged. Gibbons # 122. Scott # 135. 1906 6d Purple & Green SG72a. Chalk Paper Superb Used. Year of issue: 1906. Grade: Superb. Condition: Used. Newly Listed/New Arrivals. Commonwealth & Empire. Collections & Mixtures. 1938 King George VI SG147 20c. Black & SG150 25c. Yellow Mint Hinged HONG KONG. 1917 King George V SG5 8c. Slate Optd CHINA Mint Hinged HONG KONG. Hong Kong GV1 1945 50c SHADES SG 153 / 153a Never Hinged Mint. SEE SCANS. 1907 2d Black & Yellow SG161. Year of issue: 1907. Grade: Superb. Superb Used. Condition: Used. Newly Listed/New Arrivals. Commonwealth & Empire. Collections & Mixtures. Hong Kong 1947 KGVI 10c reddish lilac (p14) superb MNH. SG 145c. Hong Kong 1947 KGVI 10c reddish lilac (p14) superb mint never hinged. Gibbons # 145c. Hong Kong 1938 KGVI Postage Due 2c grey superb MNH. SG D6. 1938 King George VI SG155 & SG156 $1 Mint Lightly Hinged HONG KONG SEE SCANS. Hong Kong 1966 QEII 10c new blue "Churchill Commemoration" superb MNH. SG 218w. 1980 Hong Kong Share Certificate with Superb Used Selection QE2 Revenue Stamps.